"Go out and buy these games!!!" Today, thanks to some Christmas gifts in the form of money and a git card I was able to go and pick up two of 2009's best games. First for the PS3 a title developed by From Software and published by Atlus is Demon's Souls. It has lately received some wonderful good press from having won several game of the year awards in the RPG and PS3 game awards. This RPG is worth taking a look at for the mechanics that are unique to this game. The first is the ability, through the use of PSN connectivity, is to see last moments of other players as you travel through the game's world. The second is the ability of other players to come into your game for one of two purposes to aid you in your quest or slay you. To read a more detailed description you can check out the wiki page for Demon's Souls. 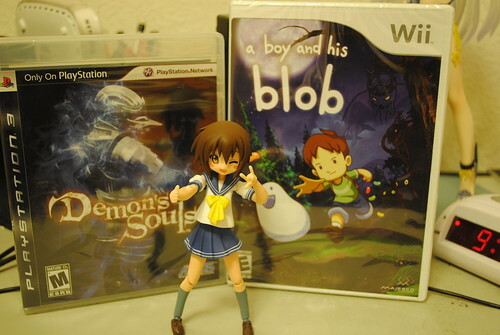 As for the other game A Boy and His Blob. This is a re imagining of the game going by the same name that came out for the NES back in the day. While the original might be not a classic this new take on is worth your time. Developed by the American developer WayForward, who has in the past done several excellent 2D games such as Contra 4 and Shantae, and released on the Nintendo Wii this puzzle platformer is one of the best Wii titles of 2009. The concept for this game revolves around the titular blob that can change it's shape by having the boy feed him jelly beans. Depending on the type of jelly bean the blob will change to different shapes to solve the different environmental puzzles. Again for more info check the wiki page for the game. If you somehow got to the end of this wall of text just listen to Misao and try them out, rent them, buy them, just play them and if you like either of them buy it to show your support for new and different game releases.